Tonight we’re eating a mexican fusion meal. Corn roasted in its husks with a chipotle lime butter and layers of refried black beans, freshly roasted red peppers, avacado, and spicy seared chicken breast. The plate was garnished with a cilantro tomatillo salsa. 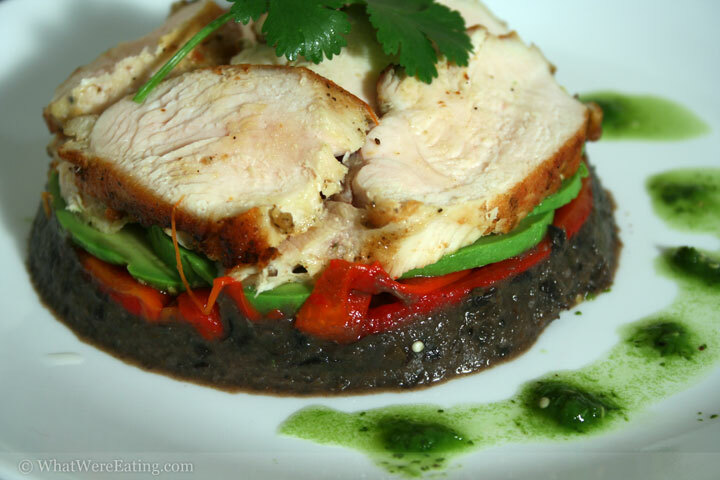 Mexican Fusion Seared Chicken BreastA:so, what’d ya think of dinner tonight? T:I enjoyed it. My favorite part was the tomatillo salsa stuff. A:which i don’t think we actually have a picture of. that stuff was rocking. I really thought the whole meal had a freshness… or lightness, to it that a lot of meals i fix don’t have. i fresh roasted the red peppers and corn. I’ve been getting all of my produce from a local california produce market. trying to do the eat locally thing! T:yeah it did taste pretty fresh. It’s funny because the beans weren’t fresh at all. A:😛 I know, but they had soooo much lime in them when i initially made them (back in like, february, or something) as a black bean soup, at your mom’s request. I just defrosted the leftover container and buzzed them with the hand blender and voila! refried black beans with an oh-so-fresh flavor! T:wow I didn’t realize it was from that soup. Freezers are amazing contraptions. A:yup! i thank mr. “i’m the first man who made a freezer” everyday! T:Yeah, thanks Mr Imthefirstmanwhomadeafreezer. You’re awesome. A:WOOO HOOO! Maybe we could give out a whatwereeating award to him. seriously. I have saved SO much money by freezing leftovers. T:Yes, we should award him a whatwereeating award. What will the “trophy” be? A piece of cheese? A:sounds about right! maybe we can shellack it and he can keep it forever… in his grave. he is dead right? T:umm… heheh, I was thinking it would be a “virtual” trophy. You know, a digital one. And I don’t want to be the one who digs up his grave so he can have a piece of shellacked cheese in there with him. A:but what if he really wants a shellacked piece of cheese in his grave? isn’t it our duty to give it to him? he did win the award you know. T:alright well you can have a conversation with him, find out what he wants, dig up his grave, whatever! I don’t want to hear about it… in fact, I think it would be best if you kept that as your own little secret. A:WHAT! You think i’m crazy don’t you? okay, maybe a little. i guess i can agree on a virtual award. T:The alternative would be to put the shellacked cheese in the freezer. You know, in honor of the freezer. A:hmmm… i think you’re on to something. can we use a piece of cheese i don’t want to eat. i have one of those we can shellack tomorrow (then freeze). T:We could use American cheese. Nobody wants to eat that. A:i actually have a piece of bleu cheese in the fridge that i was thoroughly unimpressed with…i know… me…unimpressed with bleu cheese?? it is really not good. T:should we shellack it? how do you shellack something, anyway? A:i think it’s like a varnish. you can find it in any hardware store. T:I’m liking this idea. Let’s go for it. T:yeah, you would have to make the soup first. it wouldn’t be as quick as it was tonight. Well, I give this one a 3.7/5. It was enjoyable, but I didn’t like it as much as most of the meals you make. I think what got me was the pureed beans. They aren’t my fav in general. Don’t get me wrong, it was good, just wasn’t as magical as some of what you make. A:it wasn’t but i really did enjoy the flavors. I am a lot more of a bean fan than you . You mainly like them saucy and whole right? i like them refried, mushy, whole, firm, saucy, dry, or anyway they come. yum! T:Yeah I love them whole, and with a lot of liquid. Like, soupy bean soup! A:which these were until i gave a nice buzz! oh well, you can’t win ’em all. This meal focused on a few flavor and didn’t really try to mask anything. just accentuate the ingredients. T:well I’d say you won! just because i’m a picky bean eater doesn’t mean this wasn’t a success. A: i don’t mind having a few losses. not that i consider this a loss, a rating in the 3s is a pretty darn high rating. T:yeah. It is. The tomatillo sauce alone would have gotten a very high score. You should share that recipe with the folks out there. A:i certainly will! 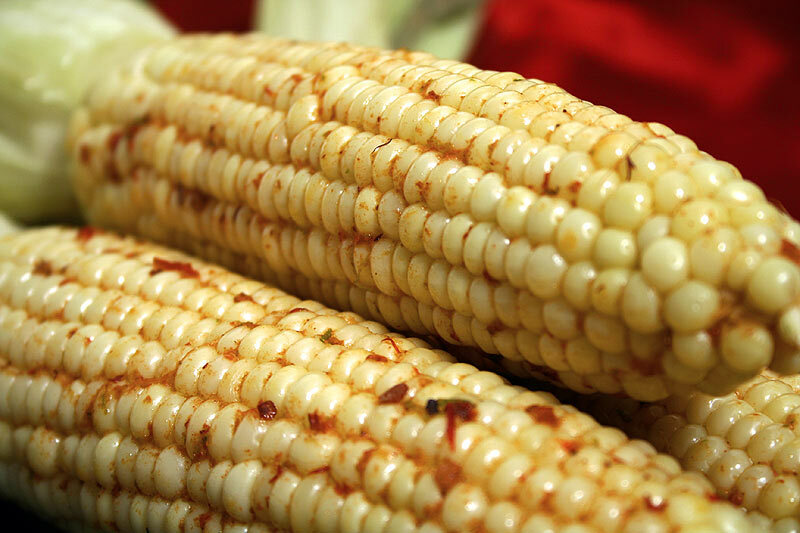 and think i’ll give the recipe for the roasted corn with chipotle lime butter. A:that can be arranged. We’ll see how close i can come to reproducing it tomorrow! Preheat oven to 350 degrees F. Once the oven is heated roast the corn, without husking, for about 30 minutes or until the corn is soft. While the corn is cooking combine the butter, chipotle pureed and lime in a bowl and mix thoroughly. Taste the butter mixture for seasoning and add salt and pepper as necessary. Once the corn has finished cooking, remove it from the oven and pull down the husks. The corn silk should remove easily and all together by simply pulling on it. Schmear the roasted corn with the chipotle butter and serve hot. Enjoy! wow, that roast corn looks scrumptious! wish I could take a bite. Thanks Cin! It was pretty awesome. Definately one of the easiest ways to make corn! You should definately give it a try. I’ll take two of those for dinner. Yum!!! I just found your site via a link on Beth’s. You take fabulous photos! You guys are so silly. I don’t know the actual person, but Amana lays claim to inventing the first “home freezer” only 50 years ago. Madame Diva: please come on! we have your two waiting. Kirk: Thank you! we just visited your blog recently and it rocks! Thanks Cate! I can’t imagine life with out the freezer. I, for some reason, thought it was older than that! I wonder if my mom remembers life with out one!